On a daily bases, I am telling patients “drink water, drink water.” And to always choose water as their first choice for a beverage. 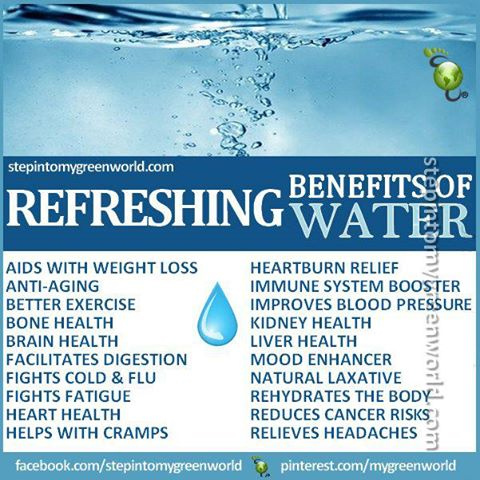 Here’s a great reasons why you should drink water. German scientists found that drinking at least 16 ounces of [room temp] water as soon as you rise in the morning boosts metabolism by 24 percent for 90 minutes. Drinking less than 16 ounces of water had no effect. What’s more, another study determined that muscle cells grow faster when they are well hydrated. Plus water also helps your system to wake up faster, so, if you feel sleepy in the morning, just drink a glass of water. This entry was posted in Acupuncture, Health and tagged acupuncture, cancer, constipation, digestion, flu, headache, tension headache. Bookmark the permalink.